We are always happy to add a song from a customer’s favourite singer, if in keeping with the style of the singing waiters act. Our popular light opera waiters include classic songs such as Nessun Dorma, Oh Sole Mio, Time to Say Goodbye, Figaro and Some Enchanted Evening to name just a few. So whichever of our singing waiter’s options you choose you are sure to be entertained with a fun, popular and exciting selection of songs. Our team of singing waiters have been entertaining for over ten years. During that time 1st Call Singing Waiters have always exceeded expectations. They perform their amazing act at weddings and special events. 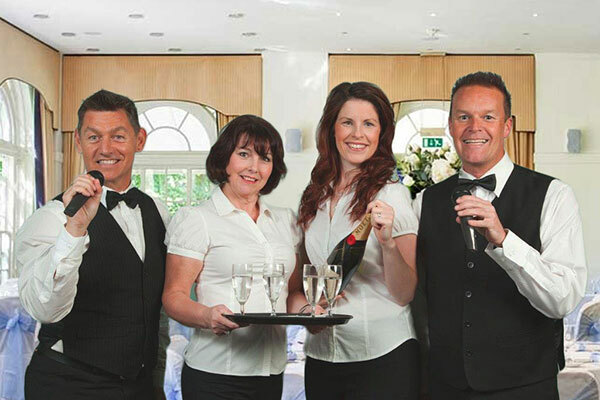 Although based in the South West our singing waiters perform all over the UK from Plymouth to Yorkshire. We have several teams of singing waiters. So if required, we are able to cover several different events on the same day. Check out our YouTube channel to see what we do. All our singing waiters are both highly experienced singers AND entertainers. They guarantee to offer your guests the ultimate musical surprise for your event. The singing waiters concept is exactly as it sounds. The Singers dress the same as your venues real waiters. They help serve part of the meal and then to the complete surprise and delight of your guests suddenly burst into song. To read more about exactly how it all works, please see our how it works page.